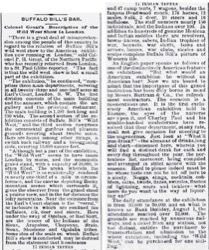 Colonel Groat's Description of the Wild West Show in London. 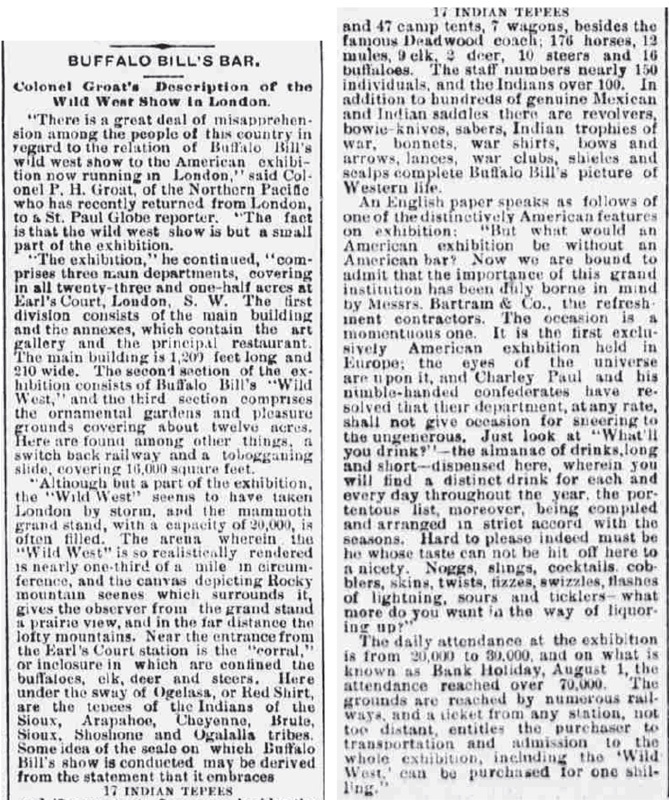 "There is a great deal of misapprehension among the people of this country in regard to the relation of Buffalo Bill's wild west show to the American exhibition now running in London," said Colonel P. H. Groat,  of the Northern Pacific who has recently returned from London, to a St. Paul Globe reporter. "The fact is that the wild west show is but a small part of the exhibition. "The exhibition," he continued, "comprises three main departments, covering in all twenty-three and one-half acres at Earl's Court, London, S.W. The first division consists of the main building and the annexes, which contain the art gallery and the principal restaurant. The main building is 1,200 feet long and 210 wide. The second section of the exhibition consists of Buffalo Bill's "Wild West," and the third section comprises the ornamental gardens and pleasure grounds covering about twelve acres. Here are found among other things, a switch back railway and a tobogganing slide, covering 16,000 square feet. "Although but a part of the exhibition, the "Wild West" seems to have taken London by storm, and the mammoth grand stand, with a capacity of 20,000, is often filled. The arena wherein the "Wild West" is so realistically rendered is nearly one-third of a mile in circumference, and the canvas depicting Rocky mountain scenes which surrounds it, gives the observer from the grand stand a prairie view, and in the far distance the lofty mountains. Near the entrance from the Earl's Court station is the "corral," or inclosure in which are confined the buffaloes, elk, deer and steers. Here under the sway of Ogelasa, or Red Shirt, are the tepees of the Indians of the Sioux, Arapahoe, Cheyenne, Brule, Sioux, Shoshone and Ogalalla tribes. Some idea of the scale on which Buffalo Bill's show is conducted may be derived from the statement that it embraces 17 INDIAN TEPEES and 47 camp tents, 7 wagons, besides the famous Deadwood coach; 176 horses, 12 mules, 9 elk, 2 deer, 10 steers and 16 buffaloes. The staff numbers nearly 150 individuals, and the Indians over 100. In addition to hundreds of genuine Mexican and Indian saddles there are revolvers, bowie-knives, sabers, Indian trophies of war, bonnets, war shirts, bows and arrows, lances, war clubs, shieles and scalps complete Buffalo Bill's picture of Western life. An English paper speaks as follows of one of the distinctively American features on exhibition: "But what would an American exhibition be without an American bar? Now we are bound to admit that the importance of this grand institution has been duly borne in mind by Messrs. Bartram & Co., the refreshment contractors. The occasion is a momentous one. It is the first exclusively American exhibition held in Europe; the eyes of the universe are upon it, and Charley Paul  and his nimble-handed confederates have resolved that their department, at any rate, shall not give occasion for sneering to the ungenerous. Just look at "What'll you drink? "—the almanac of drinks, long and short—dispensed here, wherein you will find a distinct drink for each and every day throughout the year, the portentous list, moreover, being compiled and arranged in strict accord with the seasons. Hard to please indeed must be he whose taste can not be hit off here to a nicety. Noggs, slings, cocktails, cobblers, skins, twists, fizzes, swizzles, flashes of lightning, sours and ticklers--what more do you want in the way of liquoring up?" The daily attendance at the exhibition is from 20,000 to 30,000, and on what is known as Bank Holiday, August 1, the attendance reached over 70,000. The grounds are reached by numerous railways, and a ticket from any station, not too distant, entitles the purchaser to transportation and admission to the whole exhibition, including the 'Wild West,' can be purchased for one shilling."